Do you know how to Use a Multi Meter to Locate a Fire Alarm Device or Appliance that has been connected with reverse polarity? If not this article will explain how to set the multi meter up as well as how to properly break down fire alarm circuits to locate an initiating device and or notification appliance that has been connected with reverse polarity. Real quick we will start with the basics. "What is polarity?" Polarity in electrical circuits is known as "Positive" and "Negative". In DC (Direct Current) circuits one pole is always positive (typically marked with a + or red) and the other is always negative (typically marked with - or black). Note that electrons within a DC circuit only flow in one direction. #1 is the Conventional Flow Notation. This notation is based on Benjamin Franklin's conjecture regarding the flow direction of charge. This notation shows charge flow moving from the Positive Pole of a DC circuit to the Negative Pole. This is the notation that is most commonly used my engineers and is technically incorrect. #2 is the Electron Flow Notation. This is the true notation of charge flow as it shows the actual motion of the electrons in a DC circuit. Note that this notation shows the charge flow moving from the Negative Pole to the Positive Pole. Now that we have covered how a charge or current flows through a circuit, it is important to understand how a diode works and how it can allow or block this flow from occurring. 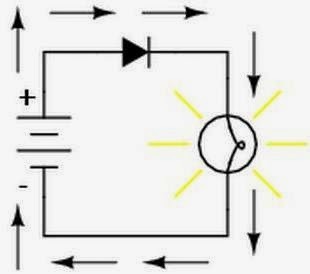 Definition of a DIODE: A semiconductor device with two terminals, typically allowing the flow of current in one direction only. This direction of current flow moves from the ANODE side through the CATHODE side of the DIODE. 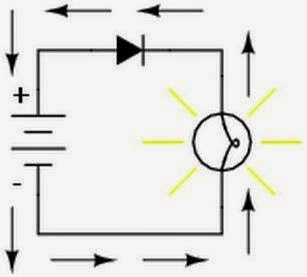 An easy way to remember this is a DIODE allows current to flow in the direction of the arrow within the symbol. Below are two diagrams that depict the same image however they show the current flowing in opposite directions (conventional vs. electron flow notation). Notice that even though they both have a diode facing in the same direction the lamp is still illuminated. "Why is this?" I thought that a diode only allows current to flow in one direction and that a DC circuit only flows in one direction. "This would make it impossible to illuminate the lamp in both scenarios, right?" This is correct. However the symbol for a DIODE has never been updated to match the Electron Flow Notation. Therefor the DIODE is always shown with the "Line" or Cathode side pointing towards the positive flow based on the Conventional Flow Notation. Note that if we were to update the DIODE symbol and show the arrow facing the opposite direction, the diagram based on the Electron Flow Notation would make more sense. Now on to the point of this article. "How do I use this information regarding current flow and diodes to locate a fire alarm device or notification appliance that has been connected with reverse polarity?" A fire alarm initiating device or notification appliance that is polarity sensitive meaning it must be connected with the correct input (positive/negative) will have an internal DIODE to restrict the current flow in one direction as stated above. We can use the diode setting on our Multi Meter to locate any section of a fire alarm circuit that has been connected backwards or with Reverse Polarity. 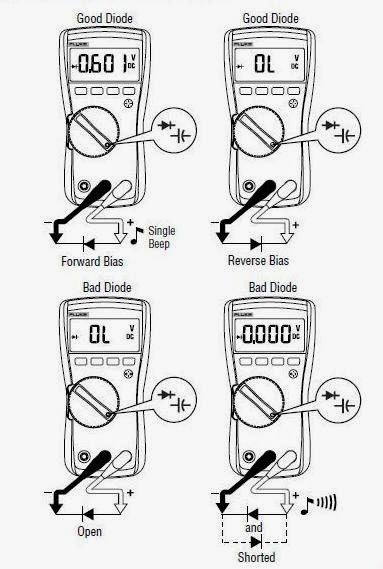 How it works: When you select the DIODE setting your Multi Meter will force a small amount of current through the DIODE and measures the voltage drop across your Multi meter test leads. Forward Bias Diodes: If you have the Positive test lead connected to the Anode side and the Negative test lead connected to the Cathode side of the DIODE, your Multi Meter should display something close to 0.548 Volts. Reverse Bias Diodes: If you have the Positive test lead connected to the Cathode side and the Negative test lead connected to the Anode side of the DIODE, your Multi Meter should display OL (Open Line). I suggest testing a single device/appliance on a specific circuit prior to searching for reverse polarity on a fire alarm run. This can be accomplished by using a spare or by taking down a device on a circuit you need to test. Once you have the fire alarm device or notification appliance removed, place your positive (red) multi meter test lead on the positive terminal of the equipment and the negative (black) multi meter test lead on the negative terminal of the equipment. 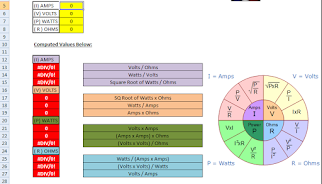 If your multi meter displays 0.548 Volts then you have a circuit with Forward Bias Diodes. If your multi meter displays OL then your circuits has Reverse Bias Diodes. Here is the key to the puzzle. If you test the wire in your circuit and your meter displays a dead short (0.000 and typically sounds a steady beep) then your circuit has one or more devices wired backwards. This is known since diodes in Forward and Reverse bias positions would allow the current in your circuit to travel in both directions ultimately resulting in a dead short. Now that you know which orientation your circuit's diodes face, you can start breaking down the circuit in halves. Each time you cut the circuit in half, read the wires in both directions paying attention to multi meter's display looking for either 0.548 V, OL or a dead short. This easy to use Multi Meter trick will help you eliminate very time consuming labor when troubleshooting fire alarm circuits.